We are talking about many animals lives, which are at stake, so please excuse the multiple posts regarding wild boar. 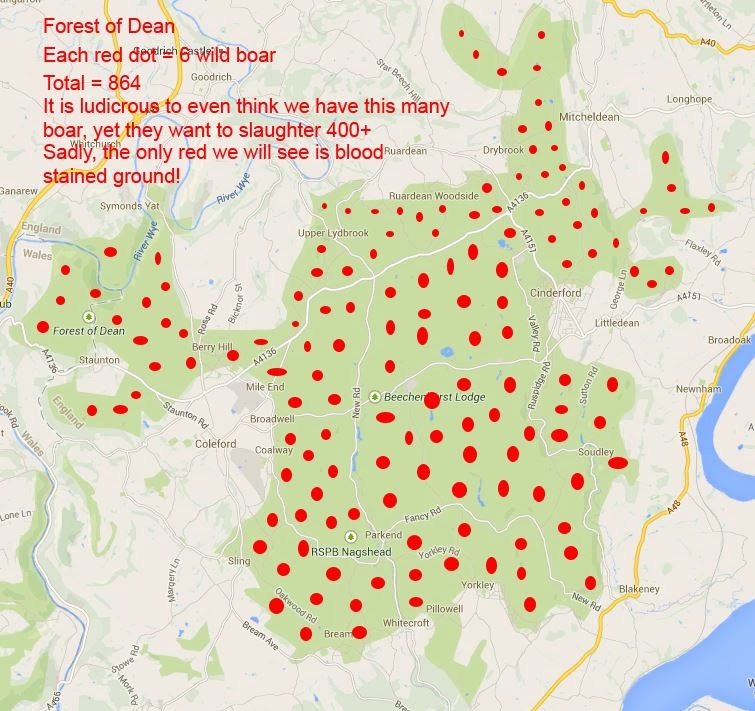 This is evidence that the vast majority of people who are "for" a mass cull of boar in the Forest of Dean, do not know what the hell they are talking about. Quote - "These animals breed three times a year and control of them is best done through a shot gun, however the Forestry Commission must take advice from experts beforehand." FACT - Wild boar have a gestation period of 120 days (or nearly 4 months). They suckle and then wean their young for a further 3 months. So how the hell can a sow give birth 3 times a year? They will struggle with two. It is impossible! These idiotic morons are comparing "wild living" wild boar to domestic pigs, which have their food supplied and their young taken away so they can breed again. 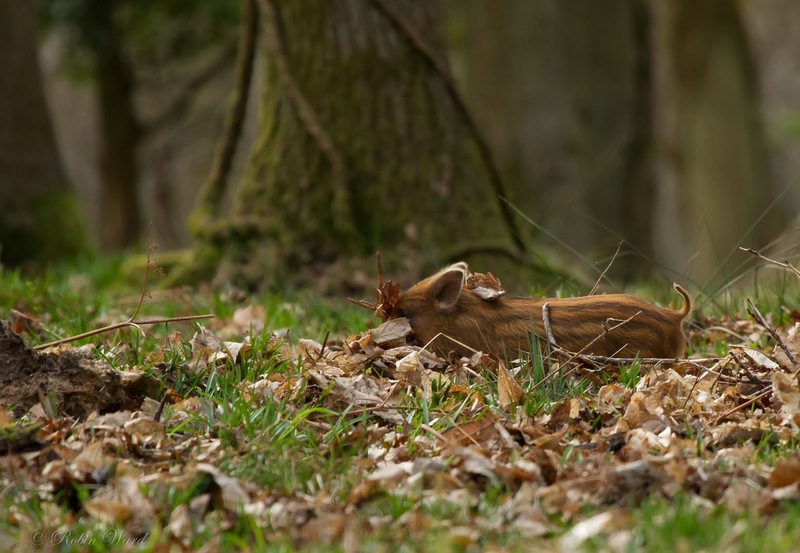 Also, in the wild, wild boar have limited offspring (ranging between 3 & 8) as unlike domestic pigs, which can have high numbers of offspring, wild boar have to find enough food to keep their little ones and themselves alive. One councillor once said "put a ring through their noses, that will stop them rooting." DOING THIS WILL STOP THEM FEEDING ALL TOGETHER. But perhaps this is what he wanted, for them all to starve to death? This is why this "MASS" cull should be stopped and these idiots silenced and kicked out of office for animal cruelty! And as for the anti-boar group called hogwatch (led and run by local people), they should be ashamed of themselves. ALL OF THEM! And before any of them ask, I was born a Forester and I have always lived in the heart of the Forest of Dean and always will. Animal cruelty and wildlife persecution at the highest level. All responsible will be held accountable after this mindless and unwarranted slaughter. Take a look below and then ask yourself why this animal is running scared and encroaching closer to residential areas? 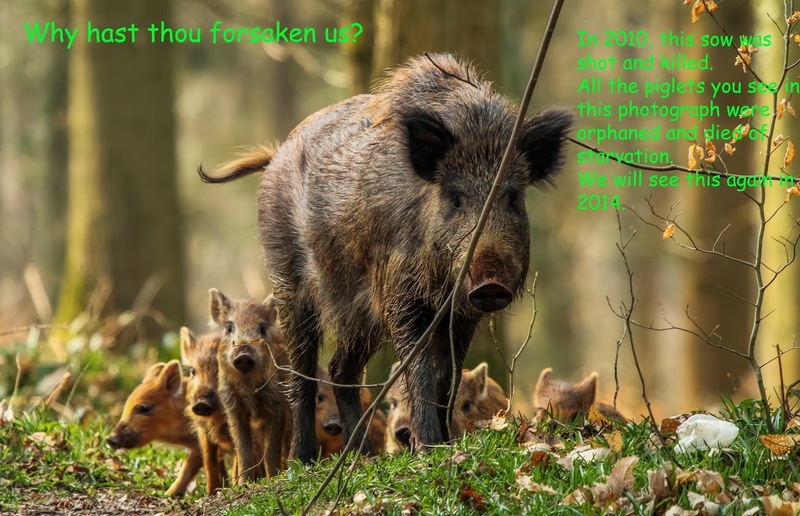 We also lose boar due to natural migration out of the Forest of Dean. None of the above has been touched on at all by the people who want them dead, while this mass cull has been pushed through. Disgraceful that our councillors, the FC, MP Mark Harper and anti-boar group hogwatch have not given this one thought. Shocking persecution over some overturned grass at the side over the road and scaremongering, which we see with so many of our wildlife species. The grass will grow back and it will cover up the dirt during the summer months, but this is not good enough for the people who want a perfectly manicured road verge, so they can park their car on it!!! I truly hope that all involved in this horrific activity are pleased with themselves, but they will be tarnished with this for the rest of their lives. Why do they think the FC is willing to shoot hundreds of boar? Because they are soon to become a self-funding body and as boar can fetch up to £300 per carcass, this will give their bank balance a massive boost. 400 boar with an average price of £200 per-animal = £80,000!!! Below is a map, a simple, crude map of the Forest of Dean. Each red dot resembles 6 wild boar, totalling 864 boar. A massive proportion of this area is now clearfell, so as you can see, if we have this many wild boar, they would be walking down every street in the county as like I mentioned earlier, they do not like open areas in the daytime. The reality is that we have around 500 to 600 boar present at this time and if they take out 400 boar, this will leave us with between 100 and 200. If we reduce their numbers this low, it could result in inbreeding, leading to a dirty gene pool, disease and birth defects. of 2,000 signatures to the council, which is just 2% of the population. Democracy? NO "persecution" from the FC, councillors, MP and hogwatch! The piglet below if from the sounder above. Less than a week after this photo was taken, she had died from starvation and a lack of her mothers milk! I did return and watched them slowly vanish, one by one as they died!